This long overdue English translation of Karl Löwith's magisterial study is a major event in Nietzsche scholarship in the Anglo-American intellectual world. Its initial publication was extraordinary in itself—a dissident interpretation, written by a Jew, appearing in National Socialist Germany in 1935. Since then, Löwith's book has continued to gain recognition as one of the key texts in the German Nietzsche reception, as well as a remarkable effort to reclaim the philosopher's work from political misappropriation. 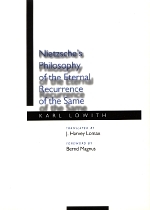 For Löwith, the centerpiece of Nietzsche's thought is the doctrine of eternal recurrence, a notion which Löwith, unlike Heidegger, deems incompatible with the will to power. His careful examination of Nietzsche's cosmological theory of the infinite repetition of a finite number of states of the world suggests the paradoxical consequences this theory implies for human freedom. How is it possible to will the eternal recurrence of each moment of one's life, if both this decision and the states of affairs governed by it appear to be predestined? Löwith's book, one of the most important, if seldom acknowledged, sources for recent Anglophone Nietzsche studies, remains a central text for all concerned with understanding the philosopher's work. Karl Löwith (1897-1973) taught philosophy at the University of Marburg until his forced exile in 1934, and then at the New School for Social Research and the University of Heidelberg. His books include From Hegel to Nietzsche (1964), Meaning and History (1957), and Max Weber and Karl Marx (1982). J. Harvey Lomax is Associate Professor of Political Science at the University of Memphis. Bernd Magnus is Professor of Philosophy at the University of California, Riverside.